1) Find a good training plan and stick to it. I got my training plan from the Runner’s World website (http://www.runnersworld.co.uk/training/). Hal Higdon also has some good ones over at http://www.halhigdon.com/. Pick one that’s the right level of commitment for you and stick to it. There’s no point picking a 6 day a week training plan if you’ve only been running once a week. Received wisdom seems to be that 3-6 training runs a week is required- with 3 being the minimum: one tempo run at a pace outside your comfort zone but which you can sustain for the duration; one track or hill session, involving shorter intense bursts interspersed by brief recovery periods; and one long run, in which you gradually increase the mileage each week. I made the mistake of over-training during the build up to Bournemouth. 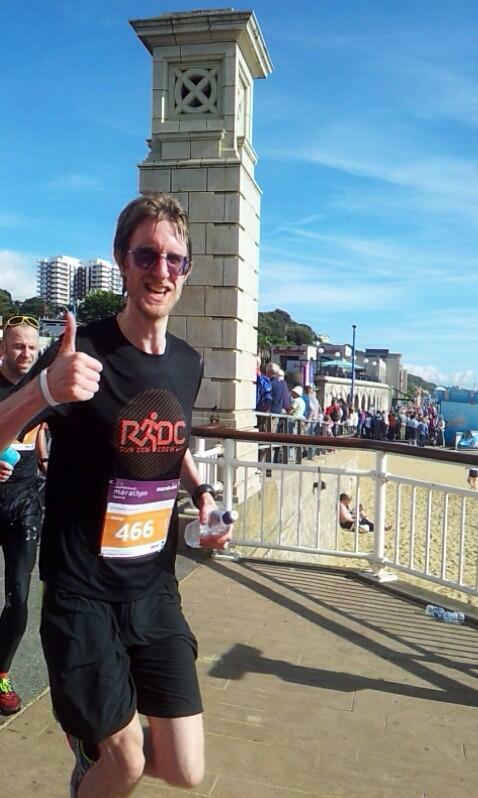 6 years after my last marathon experience, I chose to run the Bournemouth Marathon because my friends were doing it and because it would allow me to do the bulk of my training over the school summer hoilday (I’m a teacher) when I would have more time to recover. However, I was enjoying my training so much I got carried away, and ended up doing crazy blocks of really intense training back to back (read all about it here… https://anotherwisemonkey.wordpress.com/2013/09/28/one-week-to-go/ ). This resulted in my left calf blowing up like a ham five weeks from the race. I was fortunate enough to recover well enough to be able to run, but I’m sure I hit the wall after mile 18 because I had to massively reduce my training load over the last 5 weeks. Consequently, I’m sticking to 4 runs a week for the forseeable future (down from 6) and building more yoga and strength training into my training plan. 2) Set yourself challenging but achievable goals and be easy if you can’t quite reach them. The marathon distance is not a joke. Just completing the distance is a significant achievement in itself. 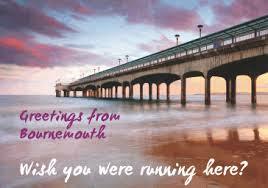 Nevertheless, some of my friends running Bournemouth seemed a little down after the race because they hadn’t quite reached the time they wanted. 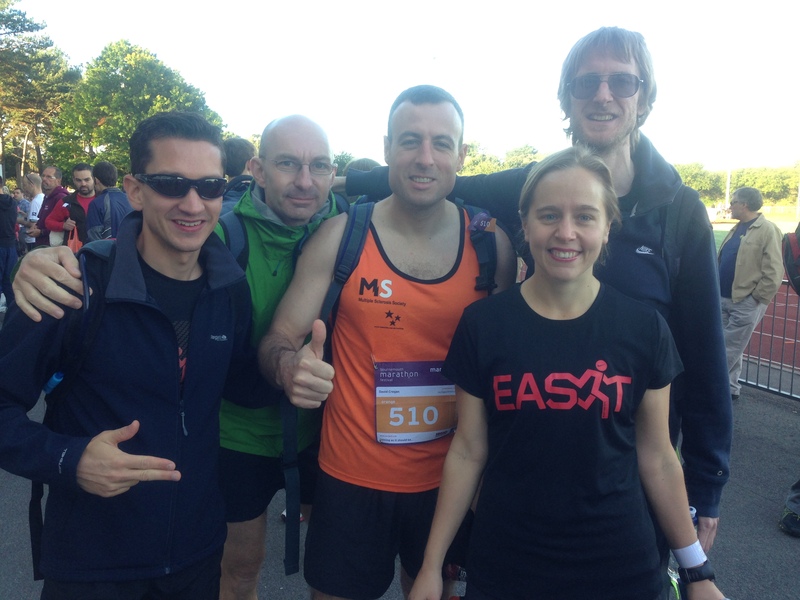 I felt exactly the same after my previous marathon experience (which you can read about here… https://anotherwisemonkey.wordpress.com/2013/05/30/my-london-marathon-experience-or-why-i-stopped-running-for-five-years/ ). They really should be incredibly proud of themselves, as it was a tough, hilly course and a very hot day, which makes a huge difference over such a long distance. Factors on race day such as the weather, the elevation on the course, the amount of sleep you got the night before- are all going to affect you. I was really lucky this time around, in that I’m a much fitter person, and a much better runner, than I was last time I attempted the marathon distance. Unless things went disastrously wrong, I was going to get a PB. But there is an art to not getting too hung up on your time, so I made that my main objective for this race. I was determined to enjoy the scenery, take in what was around me, and smile my way round. Running along the Bournemouth coastline was more beautiful than I had expected, and race day dawned warm and sunny. I’m glad that I got to see Bournemouth at her best, and will definitely be heading back there next summer to chill out on those glorious sandy beaches. 3) Get plenty of rest in the run up to the race. Obviously, I had some enforced rest through getting injured, but I also made sure to taper properly in the last 3 weeks. I was very tempted to run a 20 miler at the end of my first week back from injury, but on the advice of my friends and family, I decided not to. A good decision. I also managed to get plenty of long sleeps in during the week of the race, winding down earlier than usual during the week and hitting the hay early. There were some bad germs going around at work, so I made sure I took every precaution possible to avoid catching a cold. I dosed myself up on vitamins and ate as healthily as possible. I’m glad I’d stocked up on sleep, because the night before the race insomnia struck, caused by the excitement, and perhaps the pressure to do well, in the marathon. I haven’t had this problem with half marathons or 10Ks, but it’s affected me both times I’ve run a marathon. The distance is so much further than what I can comfortably run, so I was anxious to get to sleep, and this of course prevented me from sleeping. In the end, I only managed two hours, in separate 1 hour blocks. In the end, not being able to sleep was a blessing in disguise. I expected my body to hit the wall sooner rather than later, and saw every step I took as a bonus. I was glad to have gotten two hours, rather than none, and I had no qualms in allowing myself to walk from mile 18 onwards. 4) Have a race plan. Mine was to run roughly 7 minute miles for as long as I could, and then to allow myself to walk if I hit the wall. I managed to hit my target pace for 18 miles. There was one really hard uphill mile where I fell behind, but I was able to make the time back up on the downhill on the other side. This plan took all the pressure off me. 7 minute miles were fairly comfortable compared to the pace we often run in Elites at Run Dem Crew. It also meant that when the wheels came off, I’d gotten to mile 18 in such a quick time that even if I walked the rest of the way, it was probable I would still PB. This really freed me up and gave me permission to walk and enjoy the scenery. I want to stress the fact that us relatively faster runners in Run Dem elites have struggles in races, too. I actually walked several times over the last few miles, and had my first experience of cramp in a race. My heart and lungs were ready to continue, but my legs just didn’t have the strength. It’s something I can work on for the future, and I was happy to accept where I was at on race day. I discovered an unexpected plus side to walking. You get cheered on more vociferously by the supporters along the route, and if you actually start running again, they raise the roof. On discovering this, I may have deliberately slowed down to a walk just to get the cheer when I started running again. 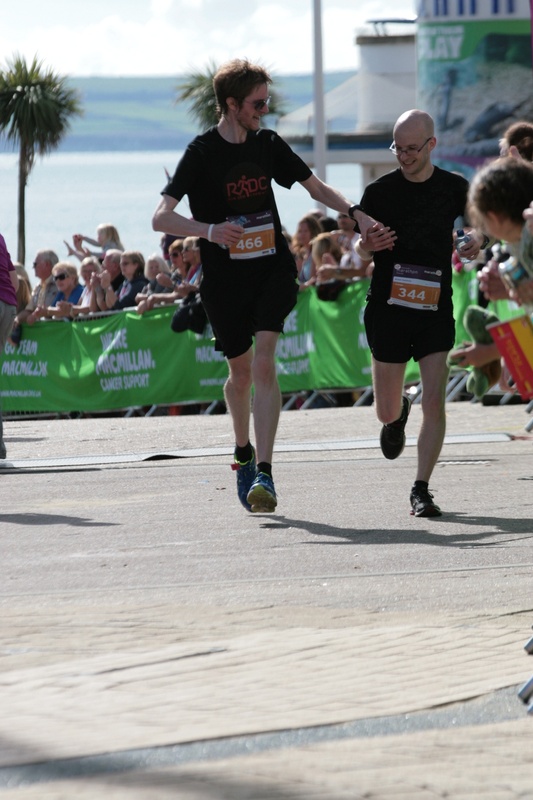 The Bournemouth supporters were a lovely, energetic lot, more than happy to high five you as you ran, and I’m grateful to them for helping me to the finish line. 5) Enter with friends. Before I joined Run Dem Crew I used to race on my own and it can be very lonely. It’s so much easier to enjoy training and racing when you are doing it with other people. There’s a real camaraderie from the shared experience of putting the miles in, especially on those long runs. On race day, and in this case over the whole race weekend, my experience was made so much more enjoyable because it was shared. It was great just hanging out with mates, eating good food, exploring Bournemouth and celebrating after the race. It was a happy accident that the course featured a number of double-backs. This meant that we all got to see each other multiple times during the marathon, and helped lift spirits when they were flagging. Double-backs are not great for fast times, but having said that, I’ve set PBs on double-back courses and a friendly face goes a long way when you’re questioning whether you can complete the distance. 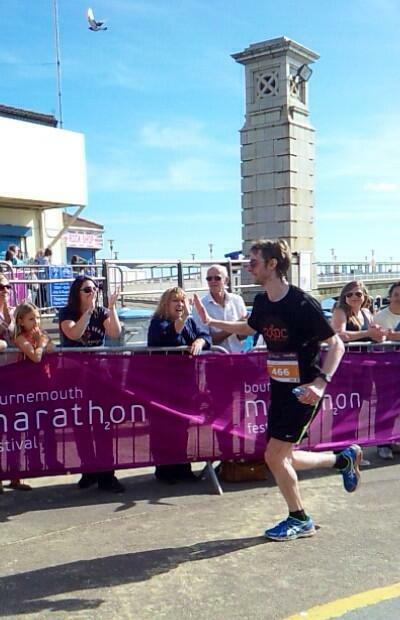 The inaugural Bournemouth Marathon was a really good race. The views along the coast were beautiful, but I’m definitely going to pay more attention to the elevation chart in future, and incorporate more hill training when appropriate. Pete, Tim and I muscled our way to the front of the Orange race pen, which made for an exciting start. We had a great view of the elite runners speeding off into the distance and it felt great leading out thousands of others after the starting gun. That said, the 10am start meant that we were running during the hottest part of the day. I’d favour an 8am start next year to avoid this, with the half marathon starting later. There were moments when I questioned my sanity as I ran with a parched throat past people enjoying ice-creams and lollies on the seafront. Next time, I’m putting a pound in that little pocket at the back of my running shorts. On the subject of nutrition, after mile 14 I couldn’t stomach any more Clif Shot Bloks, which I was using to top up my energy on the course. Anyone got any recommendations for an alternative? Throughout the race, I kept the notion this was supposed to be fun in the forefront of my mind, and did everything I could to keep it there. The medal is a really nice bit of bling. It looks different from all my others, and that’s fitting, since this was an important race for me. I crossed the finish line in 3 hours, 21 minutes, which was 1 hour and 5 minutes faster than my previous marathon PB. I finished hand in hand with a guy called Michael. I’d never met him before the race, but we kept passing each other during the race, and supported each other as if we were old friends. We bonded over those 26.2 miles. The amount of training required for a marathon is prohibitive, so I don’t plan on doing another marathon for at least a year. Still, I was able to even up my previous negative marathon experience, and look forward to also doing an ultra some day. In the nearer future, I’m looking forward to running plenty of 10K and half marathon races over the next few months, and will be involved in X-Country for the first time since I was at school. I feel strengthened through the knowledge that I’ve been able to have an enjoyable marathon race. 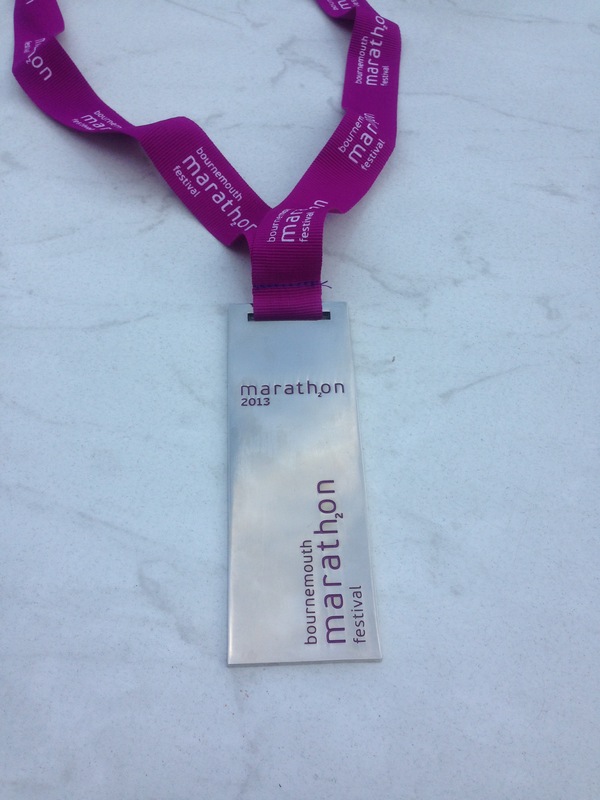 Here’s to the next one, because over the past few months, I’ve revised my opinion about marathons. Marathon training rocks. There, I’ve said it.